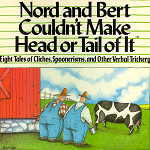 Nord and Bert Couldn't Make Head or Tail of It (Jeff O'Neill; publisher: Infocom; 1987; Z-code 4). Nord and Bert Couldn't Make Head or Tail of It - at Peter Scheyen's Infocom Homepage. Nord and Bert Couldn't Make Head or Tail of It manual in PDF format - at The Infocom Documentation Project. Nord and Bert Couldn't Make Head or Tail of It - at Wikipedia. Nord and Bert Couldn't Make Head or Tail of It - at MobyGames. Nord and Bert Couldn't Make Head or Tail of It - at Infocom Gallery. Nord and Bert Couldn't Make Head or Tail of It - at Infocom - The Master Storytellers. Nord and Bert Couldn't Make Head or Tail of It - at SPAG. Nord and Bert Couldn't Make Head or Tail of It - at Graeme Cree's The Infocom Bugs List. This page was last modified on 21 October 2014, at 18:44.